The Champions League final will be held in Madrid on June 1, with England set to play their semi-final in Portugal five days later, leaving Southgate little time to work with his players. 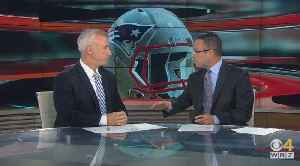 ESPN Boston's Mike Reiss joins Dan Roche on WBZ-TV's Sports Final to look ahead to NFL Free Agency. Several players including Trey Flowers, Trent Brown and Stephen Gostkowski are on the open market -- which ones will be back in New England?